For many years Gills practice has resolved around remote and often hostile locations seeking out human markers in the landscape. 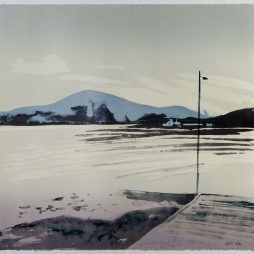 More recently Gill has moved away from transient observation and study to a more in-depth response to the environment – Landscape, Weather, Sky, Sea, History and Tales from one remote location on Morvern. 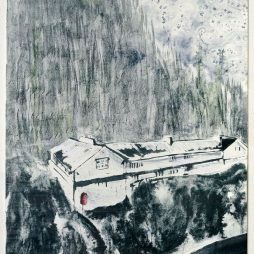 Gill works predominantly in Lithography, building up layers manipulating all the many different techniques of the medium. 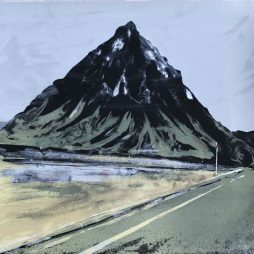 She also works in wood engraving, Screen-Printing, Mono-printing, Drawing and Painting, sometimes combining several techniques in one work. 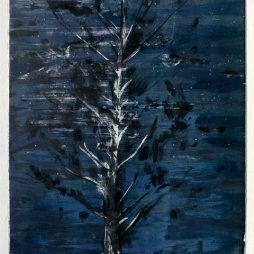 Some of her most recent works have used washes made with evaporated seawater from the location of the Image. In stone lithography and Image is drawn onto the surface of a stone with greasy materials. The surface of the stone is then wiped with water and rolled over Ink. Where there is no grease on the stone, the water repels the Ink, allowing the Image to be printed. Gill develops her prints by building up layers of colour to create a depth and intensity in deceptively simple and distilled Imagery. Her work has been likened to ” painting in slow motion “.